I learned within the first week or two of living here at the lease house that there were just a few things that try as I might, I would not be able to "change". Not only can I not change them, I can't focus on them... I just need to try to cover them up, and disguise them as much as possible. One such area is the big flat screen TV in the Living Room, that is the first thing you see when you walk in the front door. Actually, it's not the TV itself, but all the wires at the back of it, because the Entry Hall gives full view of all the technical disadvantages I look at every day. But in reality, not too many people have to see it, and if it weren't for that big ol' honkin' TV, hubby and I would probably go bonkers, cause we park our tired behinds there every night for some escapism. One thing I brought over early on was this vintage folding screen that I made over a few years ago. It hides a multitude of sins...namely the TV, VCR, tevo, sound system etc. 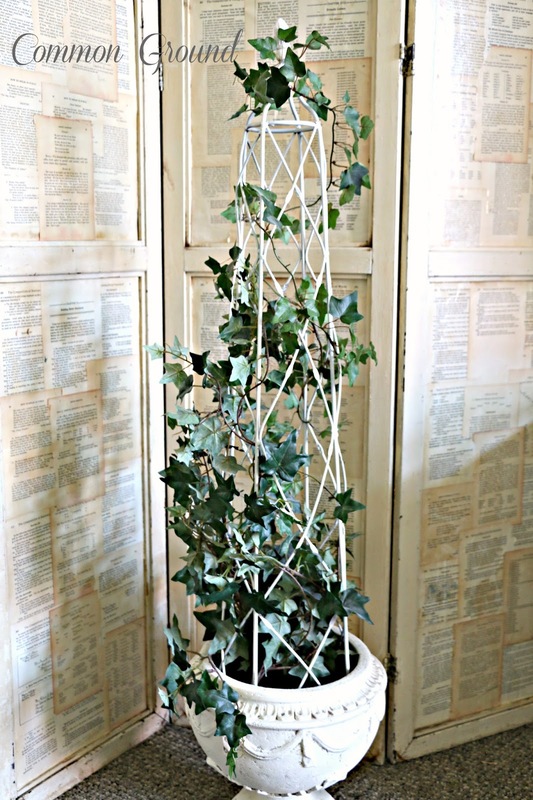 And this iron garden trellis and urn help anchor it and offer some diversion. I had my fun little garden/flowerpot wreath up there for Easter, and today I took some more photos minus the green wool felted flying bunny, but here are the ones I snapped before Easter, when a plethora of bun buns were roaming the house. I put this wreath together last year and it was on my old window above the sideboard in the Kitchen Hallway. These are French Seed Packet Labels attached to tags. 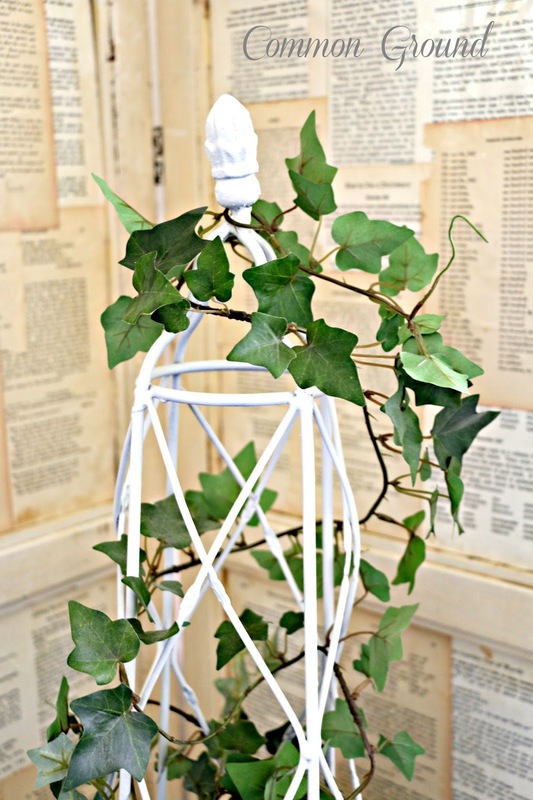 ...and whitewashed flowerpots with gardener's twine tied to the grapevine wreath. when I look at them I cannot help but smile. I have "garden fever" right now, but nowhere to "play". But I do hope to bring over a few of my potted geraniums to make it feel more homey outside over here. I "winter" my many pots of geraniums each year, but hubbs is working on packing the John Deere room, so I have orders that they've gotta go. I've lost several big shrubs from the harsh winter, and my knock-out rose bush will have to be "amputated" to the nubbs, most of it is dead too. How about you all...did most of your flowers and plants survive? Here's to the warmer weather...70's all week, yay! 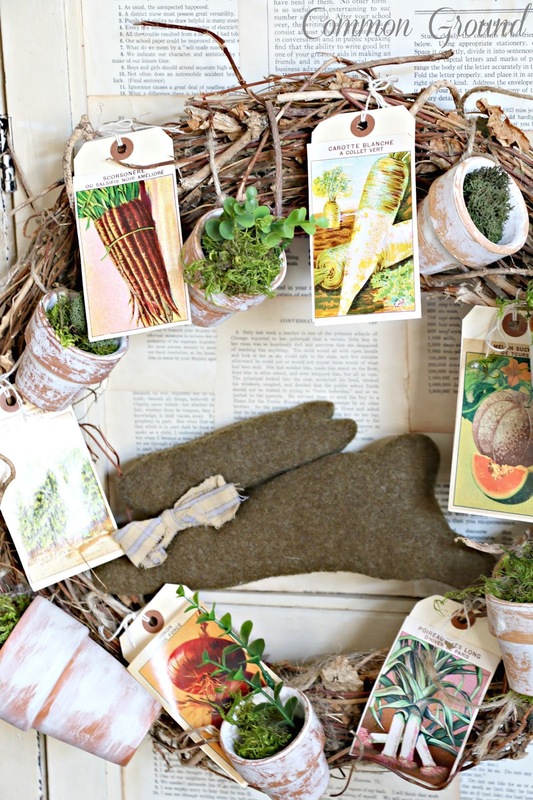 I just love your Vintage see packet wreath, being the gardener I am I'm surprised I didn't think of it myself. Oh, and yes, I do love the bow! I also love your vintage folding screen and seeing it helped inspire me. I have a "child's" folding screen and someone did a horrible job painting it? ugh!! So I will use the vintage book pages to do my. I'll be able t put it on my newly covered deck. I lost one of my favorite climbing roses this year, Jon Cabot a great climber. I'm hoping to see new growth sprouting up too. I also lost a Viburnum shrub too. My non-woody perennials seems to be doing fine. But my biggest lost is a large part of my beloved Sleepy Hollow Tree. It's as old as the charmer and the last few years have taken their toll. I never thought I would grieve losing a tree, but I am with this one. I was single when I bought the Charmer, and it was the first thing I seen while during down my street. It's been a staple to this house. I know silly to go on about a tree, but it's like family! As I was thinking, hm~m~m. . .maybe if she put a screen around the cords. . .
YOU had already done that, dear friend!!! . . .and quite nicely, I might add!!! 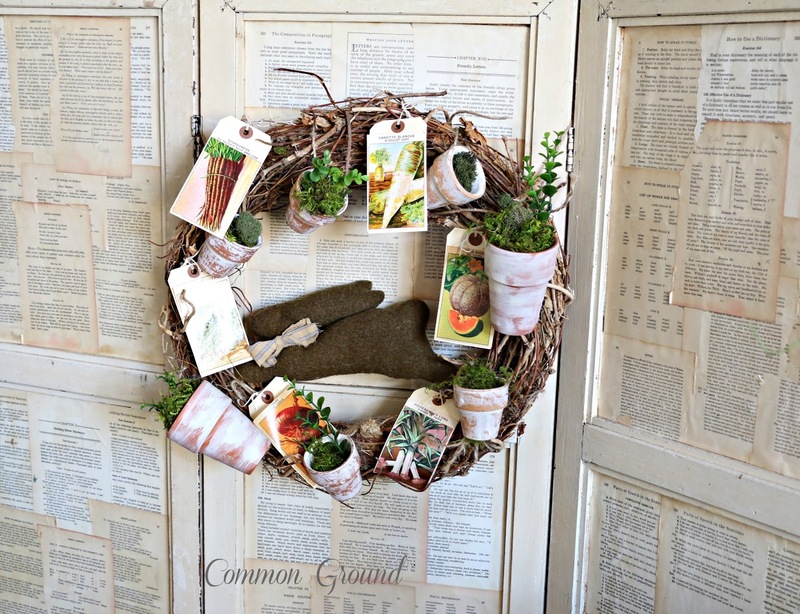 Love the wreath with the clay pots and Frenchy seed packet tags! but it appears that all others are doing well despite this horrific Winter on the Prairie! LOVE the bow tie on your bunny, too cute!!! Have a wonderful week ahead, dear one!!! I love the seed packets. Where did you get them? Your wreath is beautiful! Hi Sheila, thanks so much! 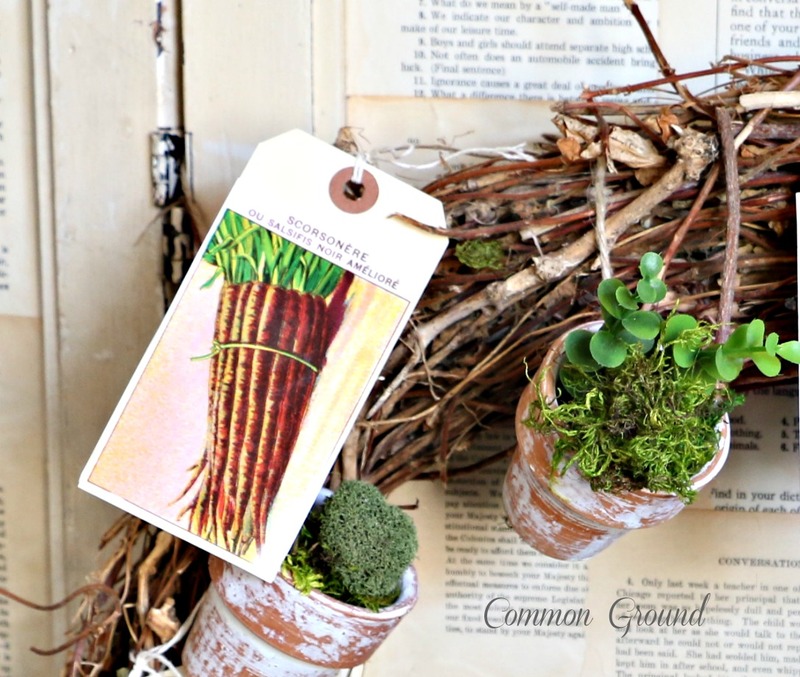 I found them on Etsy, but don't remember the name of the shop, just do a search for Seed Packet labels and hopefully she has some left. It's all fabulous, Debra! Love the wreath, the screen, and everything. Great idea to use it to cover up the stuff you don't want to see! Have a good week! I sure love your wreath and the screen, too, Debra...great idea for a cover-up! I actually bought 2 new lilac bushes last year and never got them planted..they are still in the plastic nursery pots. Yesterday, I saw they were getting leaves, even after the severe winter we had! So I have a second chance with them! Hi Debra, The screen looks great and the wreath is wonderful too. I'm sorry to hear that some of your plants didn't survive. What a shame. 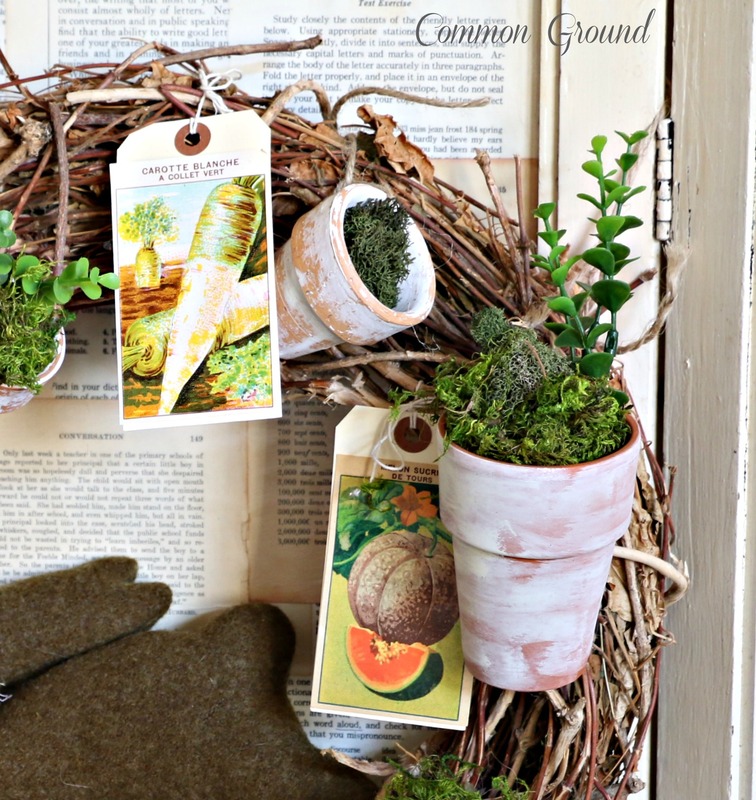 Your seed wreath and folding screen papered with book pages are wonderful! It was 86° here today and just beautiful all over! April is one of the best months to be in north Texas. How pretty, I love the wreath and the bunny, it makes a great display, and the folding screen is so nice. I am in the UK, it rarely gets above 70 - and that is in the height of summer... what ever that is! It is gorgeous here though with the spring. I just love that screen, Debra, and so glad you have it to conceal the not so pretty! It's gorgeous!! And your wreath is just darling! Have a lovely rest of the week, sweet friend! Your wreath is a beauty as well as your screen :) It's about 50 here now and so windy you can hardly stand up. love your screen, debra! i don't think any of my plants died--so sorry you lost some. 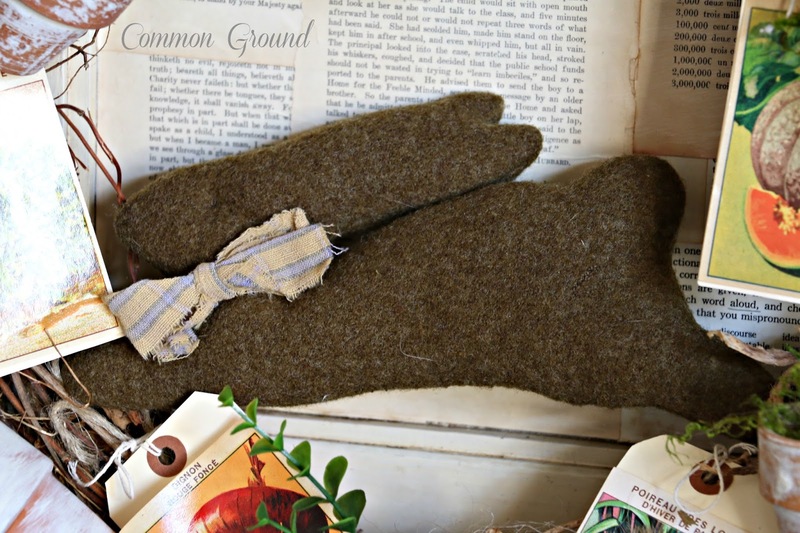 sweet bunny in your wreath, too! Love, Love, Love the wreath! Very spring and summery! Trying to grow 4 o'clocks here in the desert so hope they will last in our hot summers!! Have a great week! Everything is lovely but the screen....DROOL. I know what you mean about the TV/wires/cable box, etc. Better not to focus on it. I have Spring fever and nothing to do with it. We are barely in the high 50's today and I can't believe May is next week. I can not wait to garden! Visiting from Timewashed today. 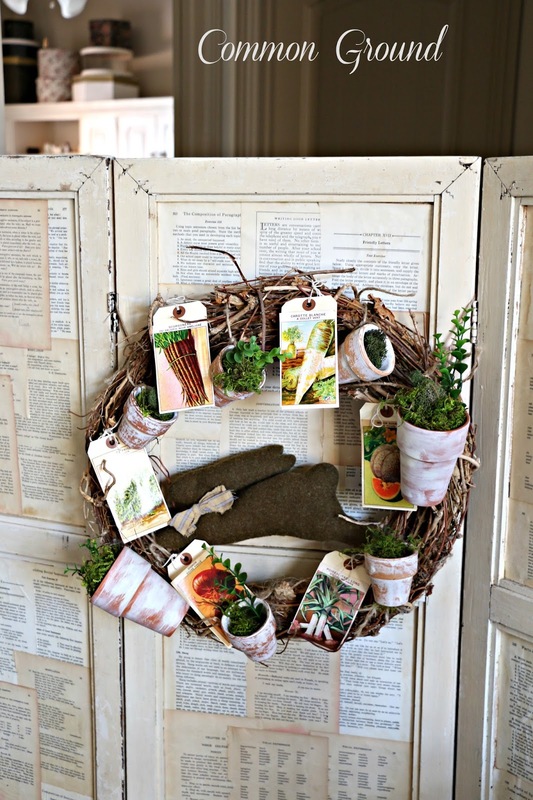 I'm in love with your Garden Wreath! 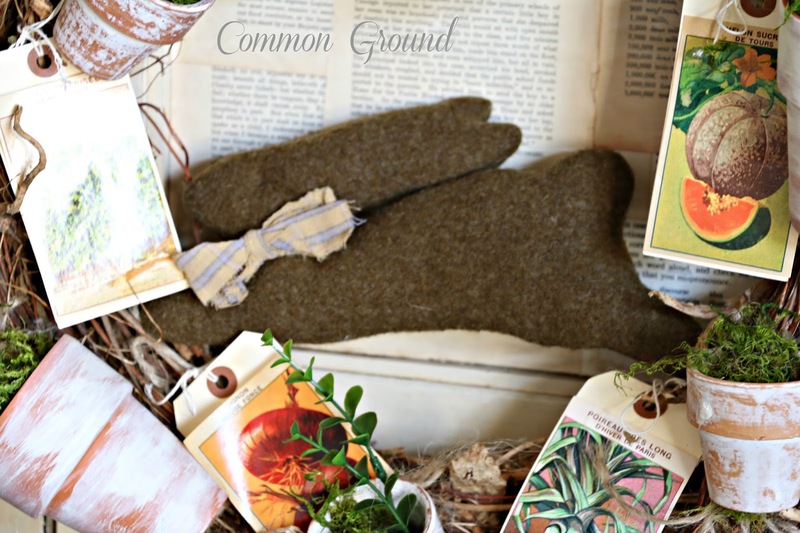 The French seed packets are so unique and the bunny is adorable! Happy Spring! I love the screen! The bunny and wreath are adorable too. I lost my Asian Star Jasmine but I think that is about it. I won't replace it but will go with something new. The low temps are getting lower in the last few years. 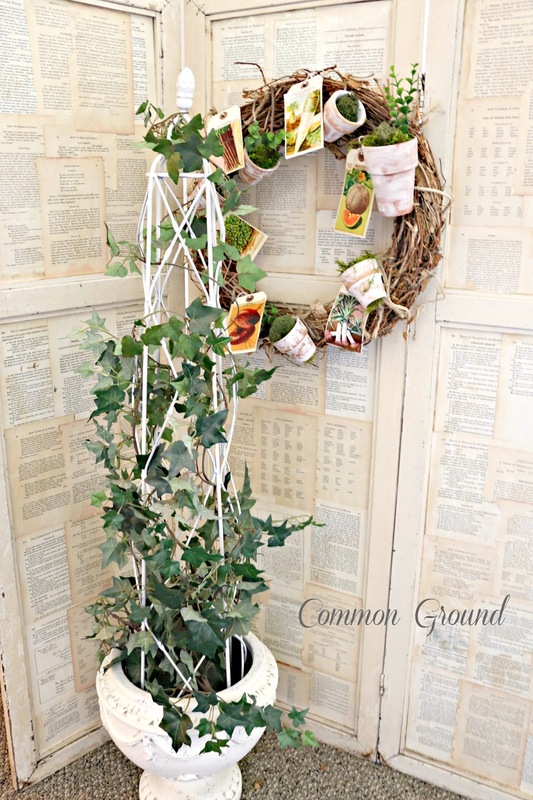 Your wreath is one of the most creative things I've ever seen, and I do remember well from your original post, I just love it...and I love that you have it inside where not only you can enjoy it, but it detracts from the technical issues of TV watching! 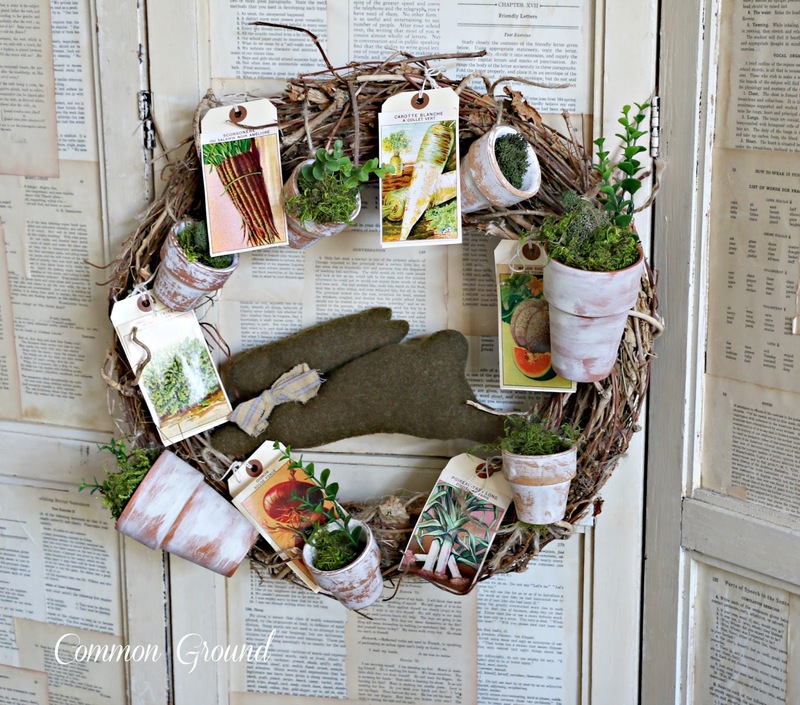 Love the seed packet wreath, so great! Such a cute wreath Debra. With the bunny it works for Easter and then w/o it looks perfect for May. Thanks for joining HSH! 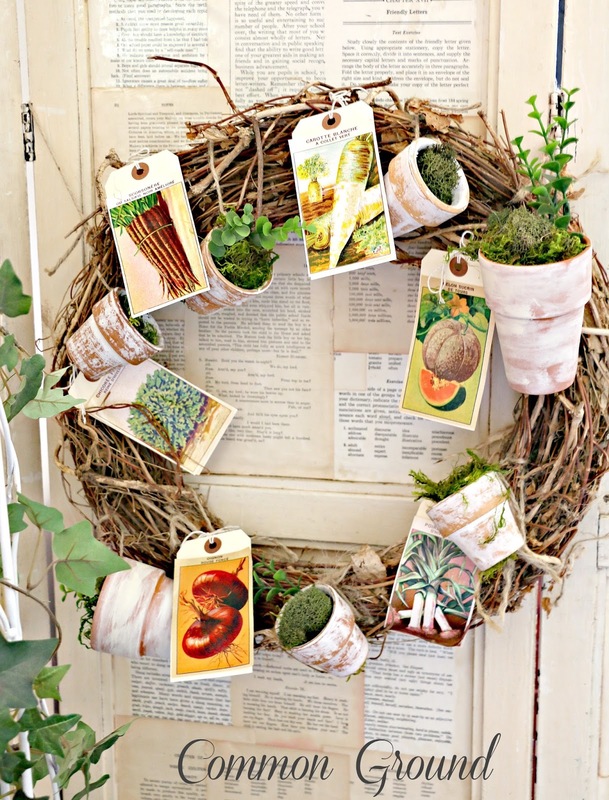 Debra, I made a seed packet wreath years ago and I loved it. 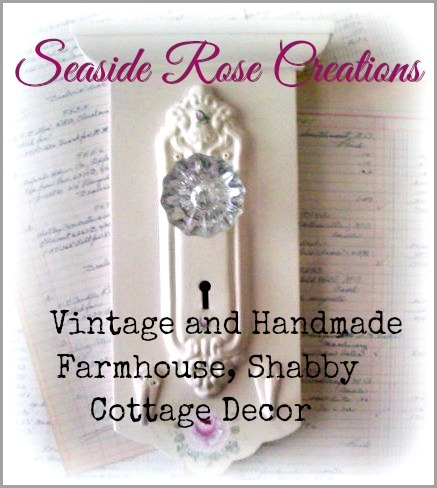 Thinking I need to make a new one. I recently covered a large O that I found at a thrift with moss. Have always loved yours! My O was not elongated so when I finished it just looked like a round wreath. Maybe I'll do something similar with it. Yours turned out so cute! Love the screen too. We just planted a knock out Rose tonight to replace one that didn't make it. I lost three plus a Japanese Maple. Thanks for sharing with SYC. So creative and an original idea. 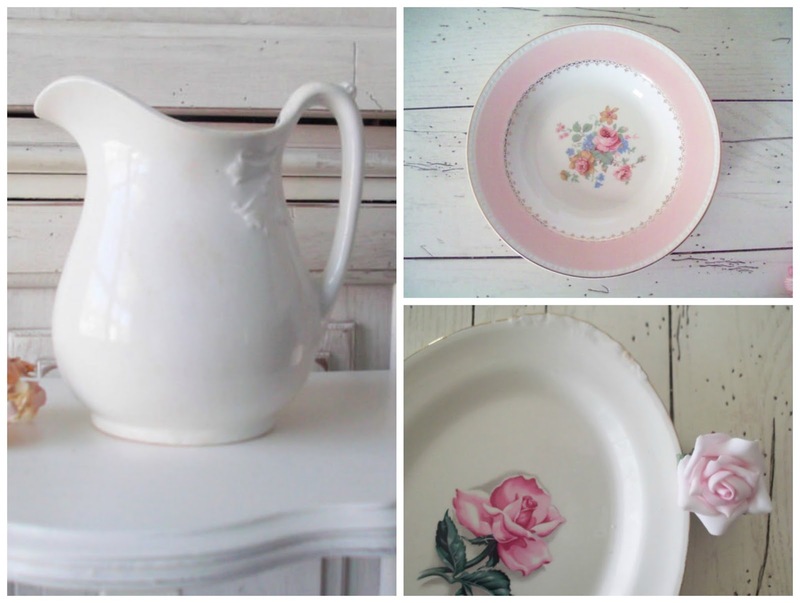 You can buy these labels on Etsy from my shop simlyfrenchvintage. Hi Debra, just hopping back to let you know that I am featuring you at SYC this week.